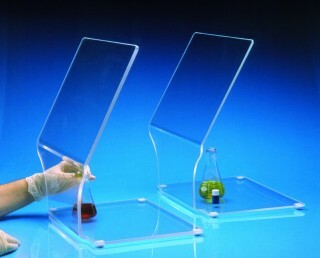 The biohazard shield top portion is 20" wide for maximum barrier between lab personnel and bio-hazardous materials. This portion of the shield is tapered back at an angle for easy viewing. It the shield tapers down to only 12" wide to allow more arm flexibility, increased movement and less arm fatigue. The flat base provides for an open work and storage area for test tube racks, pipets and other accessories. Designed for standing or sitting position. Clear, free standing and prov ide a 1/4" thick biohazard barrier.